Vivva Provencale - Emelia's "The Saucy Australian"
Skewers of prawn with capsicum, onion and bacon, topped with Emelia's La Vivva Sauce. To make the garlic butter, cream 125g of butter then add 5 cloves of garlic, 1 tblspn chopped parsley, salt and pepper (to taste) and a dash of Emelia's Garlic & Chilli Oil. Mix well. Coat prawns in garlic butter and set aside. Cut bacon into pieces, onions into wedges and capsicums into cube pieces. Thread prawn onto skewer followed with red capsicum, onion, bacon, green capsicum - repeat until skewer is full (3 to 4 prawns). Rinse and then boil 1 cup of rice with a dash of salt until just tender. Rinse and set aside. 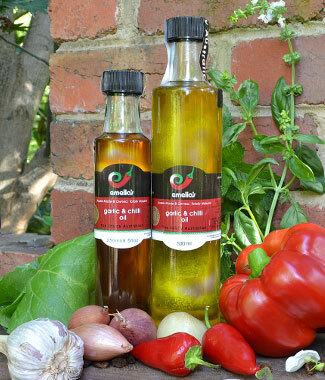 On a hot grill, put a little of Emelia’s Garlic & Chilli Oil and start to grill the prawns. 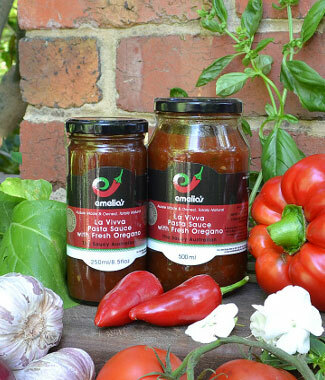 Five minutes into grilling, add and baste with a little of Emelia's Vivva Provencale Sauce. Continue to cook for a further 5 minutes. Coat evenly, serve on a bed of warm rice and slithers of spring onion. Lightly cover with the Provencale Sauce, just lovely. Enjoy!